Center Tire Wear results from a tire being overly inflated. The tire becomes domed and the amount of tire contacting the road is reduced to only the center treads. This center patch does all of the work while rolling down the road in addition to braking and accelerating, and therefore wears unnecessarily sooner. Handling is reduced due to the amount of tire contacting the road being less than the tire was designed for. Performance is further reduced as shoulder treads designed for traction, cornering or other optimizations are not allowed to reach the road to perform their duty. To ensure your tires are inflated properly, check your vehicle owner’s manual for the proper tire pressure. Side or Shoulder Tire Wear. The opposite of center tire wear, shoulder tire wear is caused when your tires are under-inflated. The center tread will often be less worn, but the shoulders are more worn or even smooth since they’re making more contact with the road. Again handling and performance are impacted due to the tire not being in proper contact with the road and able to perform as designed. You will also increase fuel consumption, as the car needs to work harder to pull the tire down the road rather than rolling efficiently. A word of advice, this type of wear happens more frequently with cold temperatures—your tires can lose 1-2 lbs. of air pressure for every 10 degrees dropped—so taking extra precaution to check your ideal tire pressure is consistently maintained. It may sound light and harmless, but Feathering signals something much more serious: improper alignment. Named for its true-to-name characteristics, feathering is difficult to spot with visual inspection but easy to feel when touched—tread will be rounded on the edges on one side but sharp on the other. Small chunks can even be gouged out during feathering and cause rapid wear of your tires. A feather on the inside of the tread bar means excess toe-in whereas a feather on the outside means excess toe-out. You can say goodbye to feathering with a prompt alignment. Flat Spot Wear is caused by skidding, usually from braking too hard in an emergency situation. In this instance, the tire tread will be mostly intact and show regular wear, save for one random smooth spot. If your tires show flat spot wear, consider getting your brakes checked, especially if you can’t remember making any hard stops as it may be a sign of a foundation issue. 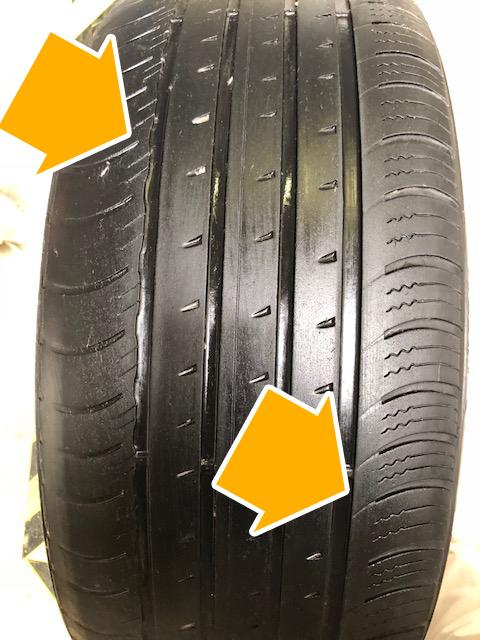 Flat spot wear can also be commonly seen on trailer tires if the braking connections is not properly installed and trailer brakes lock upon braking, wearing a flat spot in the tire. Once your tires have a flat spot there is no remedy for the situation. Cupped Wear is not a simple fix, unfortunately. 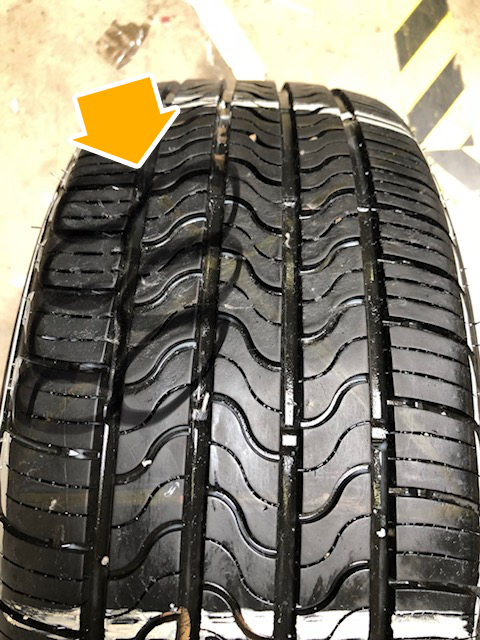 These inconsistent, scoop-like markings on your tread are the result of bouncing too much and in turn, a worn shock absorber or faulty suspension system. With ineffective shock absorbents, your vehicle will continue to bounce and subsequently gouge rubber chunks out of the tire, making for an unsafe ride. Get back to riding with confidence and balance by correcting the balance and if necessary replacing the wheels and tires. 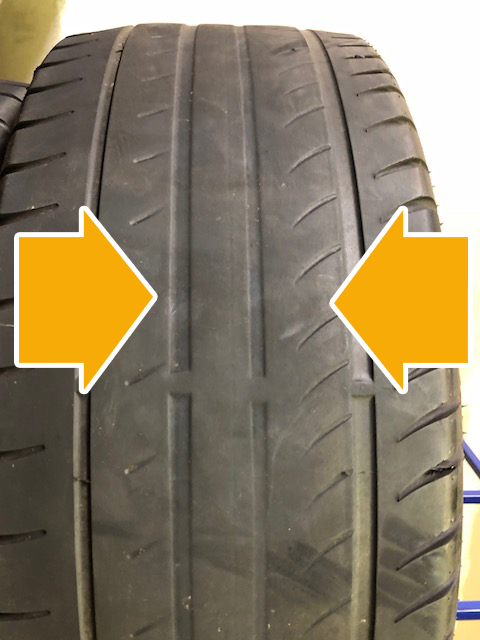 One Side Wear (also known as Camber Wear) is a symptom of a misaligned vehicle, specifically affecting the inner tread or outer tread of the affected tire(s) and the ribs, whichever is worn down more. If a new alignment doesn’t solve the problem, have your springs and ball joints checked, too. Vehicles cambered intentionally will wear tires unevenly, are easily spotted upon inspection, and void most tire warranties. Know the difference: Different tire wear can mean different things for your vehicle. Spotting the issues allows you to discuss them with your tire shop on your next rotation, or sooner if the issue warrants. After all, tires are expensive and we all want to have them last as long as possible, and we want to correct vehicle issues as soon as possible so we stay safe on the road.